It's the last day of 2011, the time of looking back and looking forward. Today I'm looking back by reviewing my first blog entry for each month of this almost finished year. January: "It's not just honeybees that are in trouble" was a post that I wrote about how pollinators in general, not just honeybees, are threatened by modern gardening and farming practices that make extensive use of chemicals. 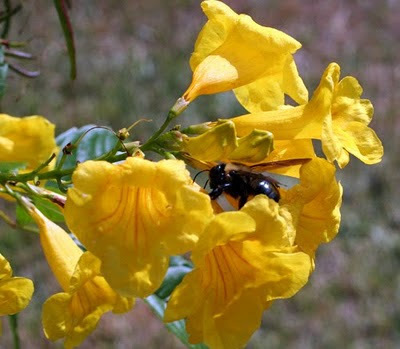 A large carpenter bee, one of the wonderful native bees that is endangered by the use of pesticides, visits yellow bells blossoms in my garden. February: We were getting ready for another stretch of very cold weather and I wrote "The best way to prepare for a freeze? Know your zone and respect it." I proposed that one of the main keys to success in the garden was reading plant labels and believing what they say and not planting things in your garden that are not meant for your zone. 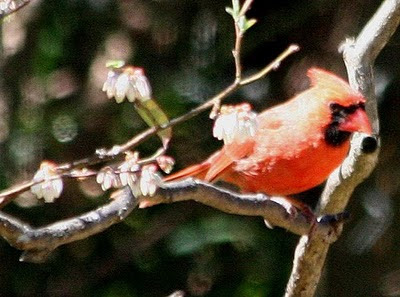 A beautiful male Northern Cardinal sits in a blooming blueberry bush. April: In "The generalist," I wrote about my visit to Arbor Gate to hear a lecture by Dr. David Creech of Stephen F. Austin University. Dr. Creech is a Texas treasure and one of the most knowledgeable horticulturists around. May: I wrote about my experiment with planting a few heirloom cotton seeds in my garden in honor of my father who was a cotton farmer. The post was entitled "The cotton is planted" and, in fact, several of the plants grew well and did produce cotton. June: The first post for June was on a Wednesday, and it was entitled "Wordless Wednesday: Red star, white star." July: My first post of the month was "Happy birthday, America!" to wish everyone a happy Fourth of July weekend. August: "Don't just do something. Stand there!" was all about the happy trend of more natural landscaping and letting Mother Nature have her way in our gardens. The message was that we shouldn't fight Nature but we should make it our partner. In fact, that's what "Gardening With Nature" is all about! September: I celebrated the beginning of the month with a wonderful poem about Nature and gardens by Helen Hunt Jackson. The poem and the post were called "September." October: I did a riff on my fellow blogger Carol of May Dreams Gardens "Twelve secrets of happiness in the garden." I always learn something when I read Carol's blog. November: I reported on my visit to Denver Botanic Gardens in "Denver Botanic Gardens - Part 1." One of the many beautiful orchids that bloomed gloriously in the Botanic Gardens. This one is one of the slipper orchids. December: The year was quickly winding down and our first killing frost was just a few days away. In "A gardener's week," I wrote about what I had been doing in my garden to get ready and I walked through the garden to record in pictures some of my last blooms of the year. This 'Ducher' rose was still full of these luscious blooms when the frost hit a few days later. So that's a review of what I was thinking and writing about in 2011. Interestingly, not one of those first-of-the-month entries was strictly about the drought, although that was the topic that dominated conversations among Texas gardeners both in person and online this year. We can only hope that the dominant topic of 2012 will be a more pleasant one. Happy New Year and happy gardening! There are always surprises around the garden, mostly pleasant but sometimes not so pleasant. Puttering around the yard today, all I found were pleasant surprises. I'm always surprised to see butterflies in the garden in winter, but there were actually several out today, enjoying the brilliant sunshine. I saw a few Cloudless Sulphurs, at least one Gulf Fritillary and several smaller butterflies that were too quick for me to identify, but my favorite was this beautiful Red Admiral. The Red Admiral was enjoying what remains of the purple lantana after our frosts of a couple of weeks ago. Another surprise that I had not noticed before was this limb of the Esperanza that had escaped the frost by snuggling up to the warm brick wall. Today a large carpenter bee was enjoying its blossoms. A Christmas surprise was this small bamboo fountain which my brother-in-law gave me in our gift exchange. My old fountain had suffered a broken arm and this replaces it. Charlie, my backyard cat, and all the animals that frequent the backyard, are very happy with it! As the days of this trying year of 2011 dwindle down to a precious few, I wonder what other delightful surprises await me in my garden before we ring in that new year. My daughter brought me this lovely plant for Christmas. Its popular name is Star of Bethlehem. Officially, it is called Ornithogalum umbellatum and is member of the lily family. I had never grown the plant and didn't really know anything about it but Dear Daughter said that the tag had indicated it would grow outside in zone 8. It really is quite a beautiful plant with its dainty, pristine white blossoms. Pretty! You can see why it would be called Star of Bethlehem. I decided to do a bit of research on the plant, since I was unfamiliar with it, and what I found is that this introduced perennial can be a bit of a thug in the garden. In some areas, it is highly invasive and the unfortunate gardeners who planted it have spent years trying to rid their gardens of it! So, its sweet, innocent-looking flowers mask an aggressive nature. In addition to its invasiveness in the garden, the plant can be toxic to animals (including cats) if ingested. This is an important fact for me to know because I have two very inquisitive half-grown kittens in my house who are prone to chew on my plants. This is such an attractive plant and it was sweet of my daughter to bring it to me. I probably will plant it in my garden after it stops blooming, but now that I know more about its nature, I will definitely be careful where I plant it and if it shows a tendency to spread in places where it is not wanted, I will rip it out! This just brings home to me the importance of knowing one's plants. I have plants in my garden now that I would not have planted if I had bothered to find out more about them before planting. If Star of Bethlehem proves to be a problem, I can't say that I wasn't forewarned. Here in my Zone 8 garden just northwest of Houston, we got our killing frost right on schedule this year. Two of them in fact. For two nights in a row early last week, the temperatures dipped to a few degrees below freezing and that was the signal to most of my plants: "Time to pull the covers over our heads and go to sleep." The result is that most of my garden now looks a lot like this, a blackened Hamelia patens that was still in full bloom at the time of the frost. These shrubs die back to their roots in winter but always return in the spring. Knowing that the heavy frost was on its way and that I probably wouldn't have any blooms for you on Bloom Day, I surveyed the garden on December 3, took pictures of most of the plants that were blooming then and posted them here. Viewing those pictures will give you an idea of what Jack Frost took. The frost took a paint brush to the sycamore trees which had continued to hold on to their leaves. 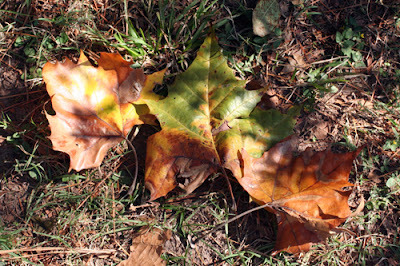 Almost overnight the leaves began to turn fall colors. A few days later, the leaves started falling. Now my backyard is covered in a colorful patchwork of leaves. To be sure, a few plants still hold onto their blossoms, like this shrimp plant (Justicia brandegeana). This is the first year that I've grown it so I'm not sure how long it will keep these interesting shrimp-shaped blooms. The plant description said that it might bloom into December. So far, so true. 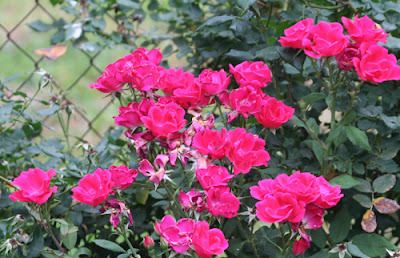 A few of the roses, including the Knockouts, 'Old Blush,' 'Dortmund,' and 'Caldwell Pink' still carry a few blooms, as well. And on the back porch, the purslane which lives in a protected spot, continues putting out these pretty little blooms. But that's about it. A poor showing indeed for December. 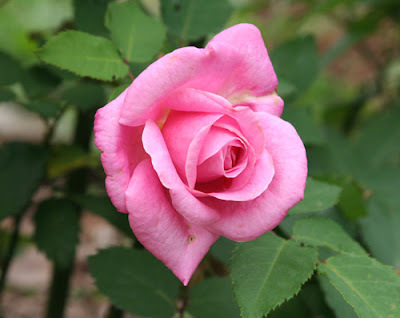 Now, if you want to see some real bloomers, visit our hostess Carol at May Dreams Gardens and see the list of this month's Garden Blogger Bloom Day's participants. Those gardens are sure to have some blossoms for you. Thank you for visiting my garden today and I wish you happy end-of-the-year holidays and a healthy and happy New Year. May your garden prosper in 2012. We had two nights of killing frosts in the garden this past week and suddenly things look very wintry. All the shrubs and perennials that are affected by frost now have blackened leaves and they've gone to sleep for the winter. Walking through the garden this afternoon, on a gorgeous late fall day, I had to reflect on the great difference that just one week can make at this time of year. A week ago the garden was still full of blooms. Now, just about all of them are gone. The 'Radazz' Knockout roses, as well as the other Knockouts to a lesser extent, are still blooming. Some of the other roses still have a few blooms as well. Where it hugs the southern brick wall of the house, the Turk's cap is still in bloom, and is still providing nourishment to the few butterflies passing by - mostly Sulphurs and Fritillaries. But other than a few salvias that are still hanging on, that's about it for blooms in my garden this beautiful Sunday. It's not a sad change though. My garden has struggled through a long eighteen months of severe drought and several months of stifling heat. It deserves a respite. Finally, it is receiving a bit of that with the recent rains and now, having been touched by frost, it has settled down for a long winter's nap. My wish for it is that it will drink deep and sleep long and then come back to me refreshed in March and April. As for me, no sleep for the gardener! I've got plenty to keep me busy until the garden wakes again. Trees are falling all over my neighborhood this week. The dead trees that have dotted the landscape these last several weeks are coming down one by one as the tree removal people do their work. Much care is needed and I certainly don't envy the workers their task. One of the dead trees will serve to illustrate the problem. It is just on the other side of our back fence in our neighbor's yard. The tree is well over a hundred feet tall. If it falls to the east, it will take out our fence and our garden shed, not to mention damaging our veggie garden and perhaps a tree in our yard. If it falls to the north, it would take out the neighbor's tool shed and/or house. There are other big trees to the south and west of it, so it will be a very tricky maneuver to remove it. I must say though that these guys seem to know what they are doing and they have some serious equipment to help them do the job. Maybe our falling trees are in good hands. It's been a busy week in the garden. I actually did get several of the tasks that I had set for myself completed. Many plants have been moved to new spots where I hope they will be happier - among them volunteer 'Laura Bush' petunia seedlings. blue plumbago, autumn sage, several volunteer flame acanthus plants, a Hamelia... Well, the list is quite long. I also got a bit of weeding done, the dead apple tree has been removed, and the pomegranate tree planted. All in all, a productive week. More could have been done but today was not a good day for working outside. The temperature was fine, but that wind! It blew continuously and hard all day long, making any attempt to work outside rather unpleasant. I finally settled for walking around the garden to document what was still in bloom here in the first week of December. We had a couple of light frosts earlier this week and, according to the weatherman, we should have a hard freeze with temperatures in the high 20s at the middle of next week. By the time December's Bloom Day rolls around on the 15th, I may not have any blooms to show you, but here is a sample of what is still blooming today. For a couple of weeks now, the 'Ducher' rose bush has been covered in these luscious white blossoms. This morning glory has done really well for me this year. Since it is in a somewhat protected place, it survived this week's frosts and is still sending out blooms. If it gets as cold as anticipated next week though, it will be gone. Likewise the purslane which has bloomed and bloomed in its pot on the back porch. The Copper Canyon daisies, seen here with some milkweed, have bloomed gloriously for a few weeks now but their blooms will not survive a heavy frost. The Hamelia patens was nipped by this week's frost but is still blooming. It, too, will go to sleep for the winter when the heavy frost comes. And so will the 'Calico' Dutchman's pipe vine, but it will be back next year. Most of the roses in the garden are enjoying a "second spring" just now and that includes the miniature 'Red Cascade.' I love these tiny velvety red blossoms. And, yes, in case you wondered, the yellow cestrum is still going strong after eight continuous months of blooming. These lovely blossoms of 'Old Blush' are a special end-of-the-year treat. The creeping purple lantana has never been prettier or more floriferous. The toad lilies continue to reward me for all those months of waiting and wondering, "Will they or won't they?" They would and did! The 'Radsunny' yellow Knockouts suffered more than any of my roses in the heat and drought of summer. I even lost a couple of them, but those that survived are putting on a show here at the end of the year. The cuphea cigar plant continues its blooming ways. And so, of course, does the dependable 'Caldwell Pink' rose. This bicolor lantana is blooming as though there is no tomorrow. And let us not forget the vegetable garden where several of the crops are doing very well indeed. That includes the broccoli which has a few heads ready for harvest. It's on the Sunday lunch menu. And it won't be long before these sugar snap pea blossoms become crisp, tasty peas. Not quite in bloom yet but this leatherleaf mahonia soon will be and once it does bloom the blossom will last all winter long. Another long-lasting blossom is this succulent, a member of the aeonium family. It has been blooming for several weeks now and shows no sign of fading. In addition to these blooms, one of the Esperanzas escaped the first frost and is still going strong, as are the Turk's caps, the various salvias, and the 'Radazz' and pink Knockouts. The garden is enjoying these pleasant days of late autumn and it is showing it with flowers. We've had light frost for the past two nights as temperatures dipped into the lower 30s. I thought at first that the frost really had not done much damage but as I walked through the garden this afternoon, it was clear that all the tenderest of the plants are gone. Banana tree - gone. Cannas - gone. Porterweed - gone. Tithonia - gone. Several other plants, such as Hamelia patens, got nipped but still have some green leaves. This was the first warning to plants to get ready for colder weather and many of them that had not already started the process will be shutting down now. By this time next month, the garden will be a very different place. I welcome the change. Winter is coming and it will be a needed respite for both garden and gardener, a time to gather our energies for the busy seasons to come. A time when the major activity in the garden will switch from actual gardening to watching the birds and making sure their feeders are kept full. There's always something to do in the garden - even if it isn't strictly speaking gardening. This is shaping up as a truly memorable day in the recent history of my garden. It has been raining steadily at least since early morning. It began sometime while I was still asnooze in my bed. I got my binoculars and looked through the window out to my rain gauge which is set up in the vegetable garden and discovered that as of noon today we had gotten 1.8 inches of precipitation. Wonderful! As I look out the window, I can see my plants fairly dancing in the rain. So, there'll be no working outside today as the rain continues to fall. It's a good day for curling up with a book. For me, that is Janet Evanovich's latest in her Stephanie Plum series, Explosive Eighteen. Evanovich is always a fun read. But I plan to spend some time thinking about gardening. It's time - past time really - to get the garden ready for winter, and there are a lot of things that I need to accomplish over the next two to three weeks. 1. Remove the dead apple tree. This is the most urgent thing on my list. I have a pomegranate tree that has been stuck in a black plastic pot for too long now waiting for that tree to be removed so that I can plant it. With just a little bit of luck, I might be able to do that next week. The old apple tree will make some wonderful-smelling wood for the fireplace this winter. 2. Get the weeds out. Every bed in the garden needs to be weeded before being tucked in for winter. This is another task that I really hope to get completed within the next week. 3. Move a few plants to better locations. This is the never-ending story of my gardening life. Moving plants around. I always find that I have misplaced some of my plants in their initial locations and so I have to pull up roots and move them. This is generally the best time of year to do that. There's less stress for the plant when the weather is cooler and there is some moisture about, and they have a chance to get their roots well-established before they have to face the long ordeal of a Texas summer. I've already started this task, but I still have a few more to do. 4. Get the new planting bed set up. I'm planning a new bed to go around the little fish pond and I want to get it all set up and at least some of the plants installed before Christmas. 5. Apply extra mulch. Most of the beds are already pretty heavily mulched, but there are some that need extra and in other places the mulch just needs to be fluffed up a bit and pulled around the plants to make a nice blanket for them. 6. And speaking of blankets, I need to get some frost cloth before we start having colder weather. Most of my plants are of the tough variety but there are a few that have suffered greatly in the extreme cold stretches that we've had during the last two winters. For the most part, they did come back eventually, but it would be nice if I could offer them some protection so that they didn't have to start over from the ground every spring. 7. Get some winter color. I really need something bright and blooming in my front yard beds for the winter. Pansies? Snapdragons? Cyclamen? Decisions, decisions. 8. Pick the citrus. My Mandarin and 'Meyer' lemon tree are full of ripe fruit that needs to be picked. The kumquat, too, has some ripe fruit, although it is still full of green fruit also. I've been waiting to be very sure that everything is ripe before I plucked it. I tried one of the Mandarins the other day. Ripe and juicy. It's time. 9. Just before frost is expected, there are a few plants that live in pots outside that I need to drag into the garage. Again, most of them have actually spent winters outside before and survived, but it is hard on them and I can make their lives a little easier by providing some protection. 10. Lastly, I need to set up my light table in the garage. Some of the smaller pots can benefit from being under the grow lights and, a little later, I can start some seeds for the spring garden under those lights. Well, there you have it - my to-do list for December. It's pleasant to think about doing all those chores and just how good the yard will look once they are all done, but for right now, it's still raining. Back to Evanovich/Plum and all those kooky New Jersey characters.